Dr. Mark Hiller, CEO , RECARO Aircraft Seating Rafał Milczarski, CEO LOT Polish Airlines at the announcement of the BL3710 seats – Image, Recaro. 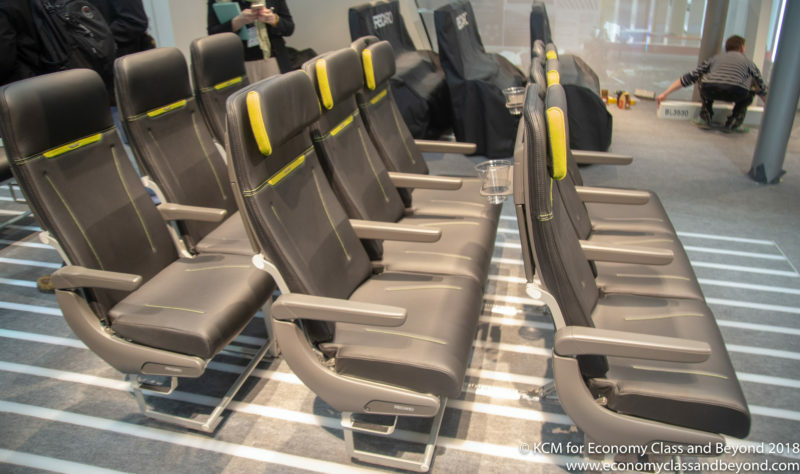 Recaro will be working to deliver the first of nine shipsets in eight month, for installation in the existing Boeing 737-800. In total 186 BL3710 economy class seats will be produced for LOT. Delivery will be during 1st Quarter 2019. The announcement was made in conjunction with Recaro launching its new “cut2Dress” facility in Poland – the new Recaro opening its its own sewing facility, allowing the manufacturer to be more flexible to customer demands and even make changes during delivery phases. And its an important thing, as this is probably the first thing you’ll see as a passenger when you board the plane – the seat and the cover on it. BL3710 – A comfortable option? Lightweight seats continue to be the thing, with the seat coming in at 10kg when fitted out. The seats will be fitted out in blue as per below, with an adjustable headrest on the top. LOT Polish Airlines Recaro BL3710 – Front view, Image Recaro. Meanwhile, the aft of the seat will feature a document holder, USB power, tray, document net and mains power too. I’ve tried these seats out in demonstration mode, and I still think Recaro has hit the nail on the head with the these seats in comfort terms – even though they’re slimline seats. They felt comfortable, and the headrest is one of the more adjustable ones out there in the short-haul market. Although avoid the exit rows. Whilst 17.1″ seat widths are in play here (mainly due to the Boeing 737 cabin width , it will get tighter at the front and exit rows. It’s the first time LOT Polish Airlines have ordered Recaro seats – indeed for their new Boeing 737 MAX 8 aircraft, they went with Lift by Encore’s tourist class seats. For Recaro, there will be hope these shipsets turn into larger orders in the future.